At this café, the cuisine of chefs like Willin Low, Shen Tan and Damian D’Silva – Low coined it mod Sin for lack of a better term to describe the melding of piquant Eastern flavours with meaty Western fare – gets repackaged for the masses. 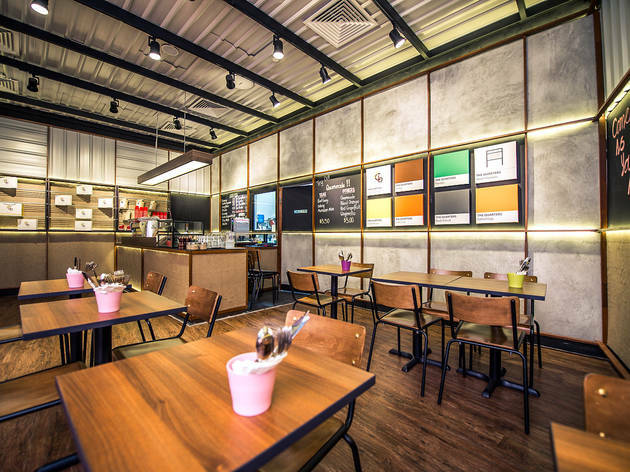 A passion project of ex-banker and durian enthusiast Chung Deming, this quick-service space in the new, hidden-away wing of Icon Village near Tanjong Pagar MRT station is his earnest attempt at selling familiar comfort food updated with a modern flair. Burlap gunny sacks hug wood-framed panels on the walls and counter, while layers of corrugated metal pitch a false ceiling over the 30-seater room. 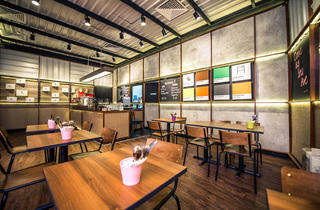 The décor is perhaps a little under-polished when juxtaposed against the tired exposed pipes-and- bare concrete aesthetic plaguing its peers, but The Quarters’ look rings true to its Singapore-loving cuisine and the ‘come as you are’ affability of the establishment, affirmed on a blackboard panel on a back wall. Open for breakfast with Western-centric egg and bread dishes on offer ($10, includes coffee or tea), The Quarters moves on to locally tinged dishes for the rest of the day. Crisp fries are an almost unnecessary accompaniment to a salted duck egg emulsion ($7.60); sharing this with a friend will be a battle of how much sauce you can scoop up with one mere fry. The hearty bowl of chilli crab and asparagus capellini ($18) grows on you after its slightly sweetish first impression. A duo of dark soy-heavy pulled pork – the Umami Babi ($8.50) – and Bibik en Vogue ($8.50) of the housemade rempah in kueh pie tee shells were perhaps overseasoned on our visit, but pack flavour promise. The dipping sauce of laksa with poached egg, served with toast ($7.80), is better avoided. A layer of oil shelters a watery bath of liquid and rempah solids, and the oozing yolk doesn’t help much to emulsify the mixture. The final flourish for a meal here has to be the durian crème brûlée ($7). The dish that marked chef Chung’s debut to the F&B industry – he sold them at pop-ups at the Singapore Night Festival and Pasarbella under the Durian Can Boleh label – isn’t as polarising as the prickly fruit. It’s available here year-round and the wobbly custard bears a light perfume of the fruit’s funky top notes. Besides the standard serves of hot and iced coffee brewed with Papa Palheta’s Throwback blend in a Synesso machine ($3.50-$6), the café also shakes up a mix of lemon, mint and dill that’s carbonated with soda to make the Quarterade ($5). A tight menu of Peroni ($8), house red and white wines ($8-$12) and Yamazaki 12 ($11-$14) is also available for a post-work drink.